As a busy mom, I am always looking for easy snacks to grab on the go that will fill my kids up but not give them a sugar high. I want something that will stay with them for a while. Quaker Soft Baked Bar is the perfect snack option for our busy lives. Between school, activities, work, the gym and trying to keep up with the house we need to have wholesome food when the day gets away from us. I really love that the kids like these great bars as a breakfast snack. Because I work at home, sometimes mommy doesn’t get to bed at a decent time. When the kids wake up bright-eyed and ready to go, it is great to have something I can grab quick and hand off to the kids for them to enjoy while I make my first cup of tea. 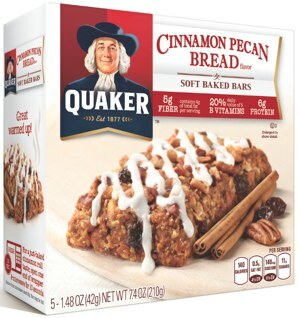 So far the favorite flavor is the Cinnamon Pecan Bread. My daughter loves anything with nuts in it and this is her favorite snack bar right now. With the whole grains and natural ingredients, I can feel good about her eating these great bars. My son is loving the Banana Nut Bread bar. 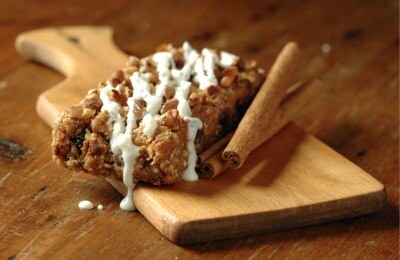 He will eat anything banana and the whole grains make this a great stick to the ribs snack. Quaker Soft Baked Bar lets me keep up the busy pace of our lives while keeping my commitment to whole grains and good food.